2018, New Committee, New Events and More! Hello everyone! It's well into 2018 and we're very excited to be back bringing you a splattering of events, news, opportunities all throughout the year! Speaking of which, our first meetup of 2018 will be March 14th, 6pm in Vandal. Tickets and more info on the event can be found here! In a panel led by Kevin Beimers (Italic Pig), starring Donal Phillips (NI Screen), Sophie Hayes (Creative Europe), we'll be seeking to provide advice on a subject dear to every game developer. If you leave Vandal without knowing how to fund your game, we've done something wrong! Next, after the AGM on the 9th January, we're saying goodbye to some old faces and welcoming in the new committee. Stephen Downey (Chairperson), Kevin Beamers, Paul Dillon, Thomas Hislop andJames Hunter. You're more than welcome to come say hi at Vandal! And finally the last two months saw several notable events. There was the Global Game Jame 2018 with Farset Labs. All of the games from this years event in Belfast can be downloaded here! Also a Communicating Game Design workshop with Kevin Beamers. ...as well as the 2nd NI Game Dev Awards! 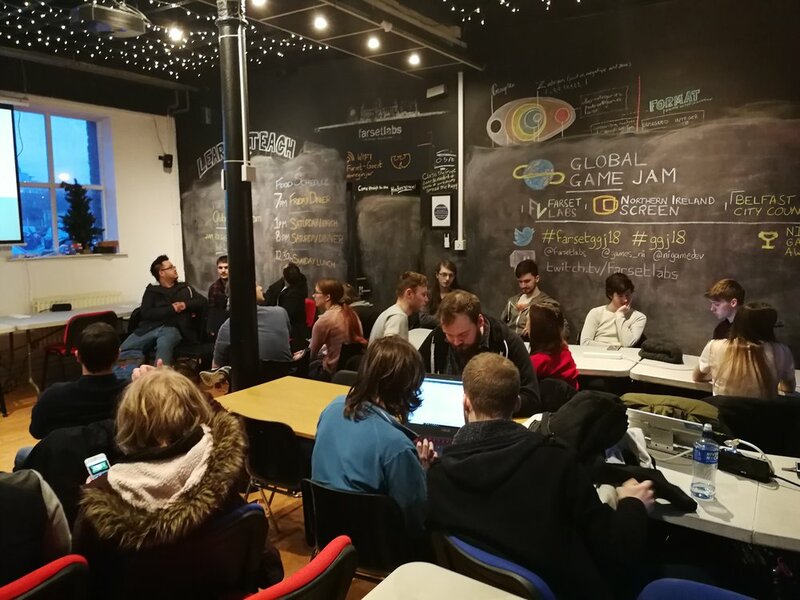 Big congratulations to everyone who was nominated and huge thanks to Angela McKeown and Peter Chapman for hosting the event with the NI Game Dev Network.